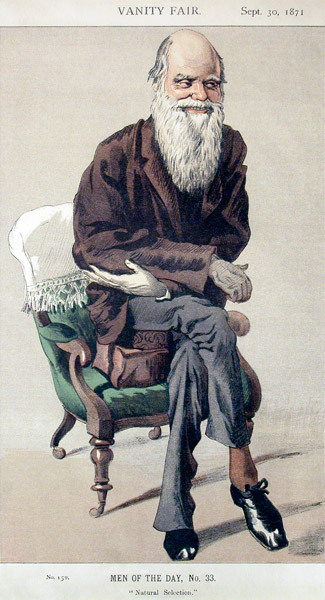 This caricature of Charles Darwin by James Joseph Jacques Tissot (1836-1902), entitled "Natural Selection," was published by Vanity Fair magazine in September 1871. The observable physical or biochemical characteristics of an organism, as determined by both genetic makeup and environmental influences; what an organism “looks like.” (adj. phenotypic) variations in body, chemistry, and/or behavior. Heredity: Some of these variations will be inherited by offspring. Overproduction: More offspring are produced than can survive. Limited resources: Survival and reproduction are determined by competition for limited resources such as food, habitat, or mates. The differences among individuals in a population. (traits or features) that give them an advantage within their environment; these individuals will survive to reproduce and pass on those traits to their offspring. Genetic composition: In subsequent generations, there will be a higher percentage of individuals that possess advantageous traits. Therefore, the advantageous traits (that help certain individuals survive and reproduce) are said to be “selected” or favored by natural selection and are thus perpetuated through later generations. Over time, unsuccessful traits will disappear, advantageous traits will become more common, and, if and when the differences are great enough, new species will evolve. The genetic makeup of an organism or group of organisms with reference to a single trait, set of traits, or an entire complex of traits. (adj. genotypic). Although there can be a large number of genetic variations (genotypes) within a population, natural selection is only able to occur if the genetic variations result in physical, chemical, or behavioral expressions (phenotypes) in individuals. Natural selection has an inevitable result — False. An important basis of natural selection is that variation is random and selection is natural, without intervention or predetermination. Natural selection has no direction. It is simply the process by which random variations that give an individual a favorable adaptation to its environment survive to be passed on to offspring. Natural selection selects against unfavorable variations — False. Natural selection is a positive, creative force of evolutionary change, not an executioner of the unfit. In other words, no feature or individual is “selected against.” If a particular variation is “selected,” an individual survives and produces offspring. If that variation is not selected, (a) the individual leaves fewer offspring, or (b) the individual is sterile and leaves no offspring, or (c) the individual dies before reproducing. Traits that are advantageous remain advantageous — False. The traits that are advantageous depend entirely upon the current environmental context. So, traits that are successful in one environment might be very detrimental in another setting or if the environment changes. Of particular concern is when the environment dramatically changes quickly (as we are seeing today as part of climate change or “global warming”). The advantageous traits of the previous generation can thus become the less advantageous traits among the offspring. Dramatic environmental changes often lead to mass extinctions, in part for this reason. Survival of the fittest means that only the best survive — False. “Survival of the fittest” is an often misinterpreted and misused phrase, especially in political or social terms. Fitness in the Darwinian sense does not necessarily mean long life, a hot car, and a million-dollar house. Evolutionarily, an underpaid waiter who dies at age 35 leaving five surviving children is more "fit" than an 80-year-old millionaire with one spoiled heir. Fitness in the Darwinian sense is defined as the relative genetic contribution to the next generation. Natural selection of advantageous traits makes the species more complex — False. Clams and humans are both equally suited to their environment. Although the human body is in many respects much more complex than the body of a clam, modern clams and humans are similarly “evolved.” In fact, clams have been on Earth much, much longer than humans.